Product #20731 | SKU EON615 | 0.0 (no ratings yet) Thanks for your rating! 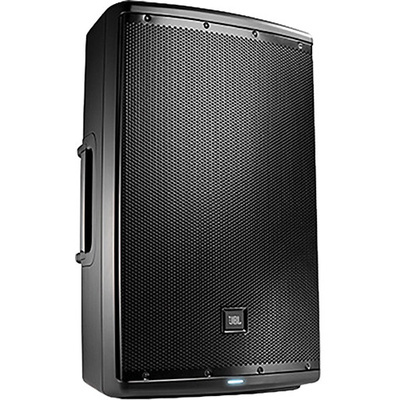 The EON615 from JBL is a 15"(38.1 cm) two-way powered speaker system with 1000 W of Class D amplification and two input channels. Designed for high-quality audio reproduction, portability and flexibility, the EON615 can be used in a variety of configurations and scenarios. It works as a single speaker, in a stereo set up with another top cabinet and a subwoofer, as a floor-monitor, or in permanent instal applications. The speaker features onboard factory AEQ presets that allow you to set the system as a main house speaker, as a monitor speaker, or as a top speaker for use with an EON subwoofer. It also has a speech setting for increased vocal intelligibility in PA and announcement applications. The rear panel provides XLR-1/4" combo inputs for each of the speaker's two channels, along with individual gain controls and signal presence LEDs. Both inputs are mic or line selectable and a master volume knob adjusts overall system level. The EON615 also features an iOS and Android supported Bluetooth interface for controlling master volume, adjusting the parametric AEQ, and saving and recalling user presets.